Nothing says autumn like a hot bowl of comforting soup. This creamy vegan soup has a rich flavor from the slow sautéing of the leeks, onions and garlic. 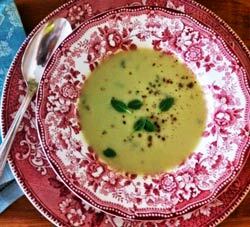 I substitute zucchini for potatoes in this recipe to keep it a low glycemic soup. It freezes well if there are any leftovers. As always, try to use as many organic vegetables when possible. 2. Add celery, zucchini and poultry seasoning and sauté for an additional 5-7 minutes, stirring frequently. 3. Add purified water and cover and bring to a gently boil. Simmer until all vegetables are tender but not overcooked. 4. Turn off heat and add almond milk and stir well. 5. Pour soup into a high-speed blender and process to a creamy consistency. 6. Return soup to pot. Taste and adjust seasoning. Add fresh thyme and cracked pepper and serve immediately.